It’s March and I have 3–foot–high plowed banks of snow on my driveway, a good excuse to not get my trailer out of the garage to take it to Albany, Ore. for the Northwest Fly Tyer and Fly Fishing Expo. I got a hotel room. High school sophomore Maxine McCormick, multi-time world fly casting champion, demonstrated casting at the Expo this year. I have seen her cast before and she was remarkable. I hope you made it to the Albany Expo this year and I hope you joint Washington State Council’s Fly Fishing Fair in Ellensburg May 3rd and 4th. 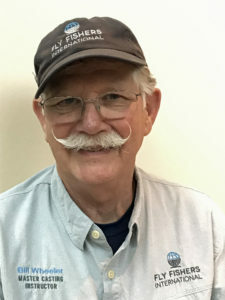 Online registration is up and running and we have collected a great group of tyers and casters, as well as our Celebrity Fly Fisher, Gary Borger. By the way, I stole the title of my column, Prime Lies, from him. Our volunteers have put a huge amount of work into this endeavor. Please come out and join the fun and learning. If you are coming and have some free time, consider volunteering for such things as making the coffee, helping with the raffles, setting up the tables on Thursday, and a thousand other things. Contact Carl Johnson or me if you can help. There will be a few changes this year in the Fair with a Fly Tying Theater, tying lessons and demonstrations by Gary Borger. In addition, we will be holding a Continuing Education (CE) program Saturday afternoon for all casting instructors, whether they are FFI certified or not. We just want to improve fly casting instruction for everyone and we know there are lots of people out there teaching fly casting through clubs and shops who have been excluded from CE events in the past. All those people are now welcome to attend this Saturday afternoon program. Everyone is better off if we can improve fly casting instruction. If you can’t commit a full afternoon to CE, Don Simonson and Robert Gerlach will be doing a workshop for club casting instructors. Thursday evening will be a free dinner for volunteers and the famous dessert auction to raise money for groups like Project Healing Water. Friday evening is the Awards Banquet and Live Auction. Be sure to attend and help recognize some of the great people who have worked so hard for the Council and help raise money for other deserving organizations. Both events will have a no host bar. Will Godfrey will be the auctioneer again this year for the live auction. That man knows how to run an auction. It’s always a blast. Finally, Saturday evening the Yakima River Headwaters TU Chapter is sponsor the Fly Fishing Film Tour right in the main hall in the armory. To register, go to the Washington State Council website www.wscffi.org then go to Fly Fishing Fair in the black banner and then to the bottom of that page. I’m registered, are you?